Former Indianapolis Colts head coach Tony Dungy shared thoughts on character, success and leadership with an enthusiastic Samford University audience Tuesday, Aug. 31. In 2007, Dungy led his Colts to a Super Bowl win over the Chicago Bears, making him the first African-American head coach to claim that championship title. Since retiring after the 2008-09 season, he has been an analyst on NBC’s Sunday night studio show and is a national spokesman for the fatherhood program All Pro Dad. The convocation, which recognized student leaders, included presentation of the annual John H. Buchanan Award for Teaching Excellence to mathematics and computer science professor Dr. David Foreman. Donor relations director Judi Aucoin received the President’s Award for special work performance. Merit awards went to employees Ivy Alexander, Jane Leask and Lauren Taylor. 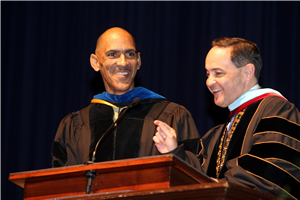 Introduced as a surprise guest during the first convocation of the fall semester, Dungy responded to informal interview questions posed by Samford president Andrew Westmoreland. He said that a number of people in his life taught him trademarks of character. “With one minute left in the Super Bowl, I thought about how my parents gave me a Christian foundation and the confidence to think outside the box,” said Dungy. Teachers and coaches talked about developing as an athlete and also as a person. And there were teammates and pastors who, by one thing they said, could send a life in a different direction. “One sentence might turn a person’s life,” said Dungy, who has written several books. His most recent, The Mentor Leader, debuted earlier this month. About success, Dungy recalled wisdom he learned as a player and assistant to Super Bowl winning Pittsburgh Steelers coach Chuck Noll, whose advice was to never make a career decision based on money. Rather, consider the relationships involved, and how they could help you be a better person. “But real success is how you use your talents for the Lord,” he said he told them. Character and integrity are two different things, said Dungy, citing his dad’s belief that it’s not what you do in life, but how you do it. Since retiring from professional football, Dungy stays busy with broadcasting, faith-based public speaking, and “always trying to determine where God wants me.” A twice-monthly phone Bible class with other coaches helps. “Those calls help me stay focused and still stay in touch with the Lord in the midst of a heavy schedule,” he said. In reference to the Samford Bulldogs season opener football on Saturday against Florida State, Dungy diplomatically shunned picking the team from the state where he once coached the Tampa Bay Buccaneers and now calls home. “I’m picking Samford,” he said to thunderous applause.